First 50 people to register get a FREE drink ticket (wine or draft beer)! All Coaches & Coordinators in attendance will receive a FREE drink ticket! Spread the word and receive 5 bonus race tickets for each registrant who "mentions" you in their registration! Race Tickets can be wagered on horses and used in a fishbowl raffle for a chance to win from ±10 prizes! Bet any number of tickets on a horse. If your horse finishes in the money, you win! Beer & Wine available for purchase throughout the evening. Pop, water, and light snacks will be complimentary. Food will also be available for purchase from Tortilla Mexican Food Truck outside the gym! * Pull‐A‐Rose: $5 per rose for an opportunity to win a mystery prize!! $25 Admission - Includes 25 Race Tickets (Additional race tickets available in packets of 20 ‐ see below). Name your horse and cheer it on to victory! Win (1st place) wins 100 tickets | Place (2nd place) wins 50 tickets | Show (3rd place) wins 25 tickets. Sponsor a race and have your Family name appear on the projection screen before one of our 10 races! Our 10 Corporate Winner's Circle Sponsors will have their corporate logo showcased in the background during winner's photo opportunities, on the projection screen between races, and online following the event. Good for 5 drinks at the event (beer / wine) - that's five drinks for the price of 4! No refunds / cashouts of unused drinks. Be in control of the music for a 15-minute block of time! Participate in an entertaining group game of heads or tails for two chances to win a cash prize. Your entry fee includes one (1) St. Michael-branded silicone wristband. 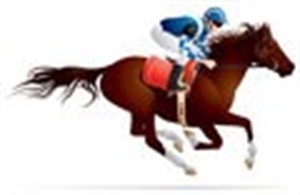 Select an Exacta square off our board (see link below)! Each square gives its owner a combination of two horse numbers for the entire evening. If those two horses come in first and second place in order in any of the even race numbers (race #2,4,6,8,10), you win $100!